Intense red and dark fruit flavours in abundance with more complex characters of earth, minerals, mushrooms and floral aromas. Only 60 dozen produced from our small patch of Cabernet vines planted in 1965. The palate is full-bodied and greets you with juicy red-black fruits followed by toasty hazel-nutty oak and chocolate. Well structured, this is a complex wine with fruit at the fore but background oak in support. 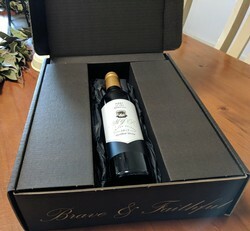 If you like our wine, join the club! Bless this wine for it makes clear the argument that old vines, in this case 100+ years, are distinctive & distinguished. The full-bodied palate is glossy and seamless, the tannins velvety and powerful, & the finish long. In between there's licorice, sweet oak & a core of exceptional fruit. Crafted from our early picked Shiraz fruit, the style is a perfect marriage, not too sweet & not too dry. Delicately fragrant, exuding strawberry & toffee apple. High Eden cool climate characteristics, subtle fruit flavours and crisp acidity. The 2017 vintage was long and cool, idyllic slow ripening conditions, for dependable Riesling charisma. ‘The Sweet Hart’ Moscato styled grape cider is created from a rare patch of certified organic Riesling grapes from Eden Valley. Lightly spritzed, our Moscato has lifted citrus and tropical fruit aromas. Exudes aromatics of blackberries, chocolate, raisins, musk and floral perfume. The full-bodied palate is rich and generous showing complex dark fruits balanced with a gently warming brandy spirit and controlled sweetness.